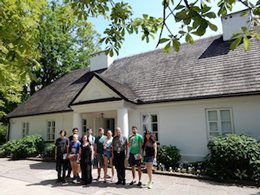 Slawomir Dobrzanski, professor of music, led a group of K-State students, faculty and community members on a tour of classical music-related sites and museums in Germany and Poland. The group visited Johann Sebastian Bach museums in Eisenach and Leipzig; Robert and Clara Schumann museums in Zwickau and Leipzig; the Felix Mendelssohn-Bartholdy Museum in Leipzig; the Richard Wagner House in Bayreuth; Ferenc Liszt museums in Weimar and Bayreuth; and Fryderyk Chopin museums in Warsaw and Zelazowa Wola. Additional sites visited included Wartburg Castle; the Martin Luther Museum in Eisenach; the Princess Anna-Amalia Library in Weimar; the Gewandhaus; St. Thomas Church and Grassi Museum of Musical Instruments in Leipzig; the Buchenwald Nazi Concentration Camp; the Holy Cross Church; historic Old Town and Wilanow Royal Palace in Warsaw.